Our favorite Man of Steel (sorry, Dean Cain) and MMA fighter-turned-actress Gina Carano have just added a new member to the family. Take a look at their adorable Akita puppy. 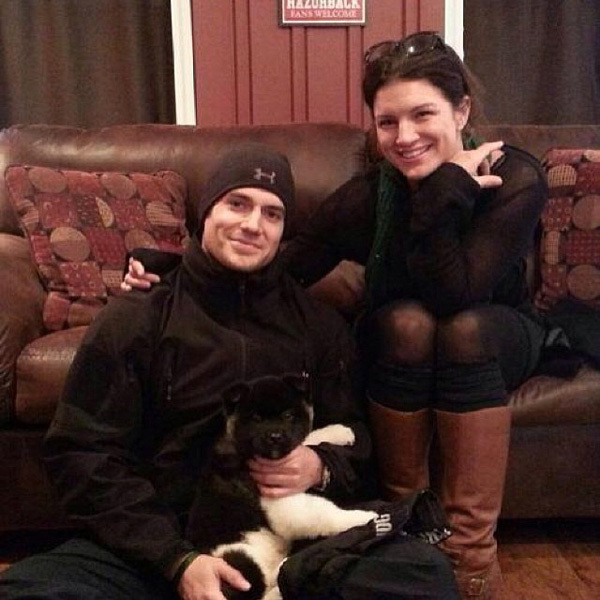 It’s been quite a roller coaster for Henry Cavill and Gina Carano, who began dating in September 2012, but split in early 2013; but with newly released photos of the couple’s new puppy, it looks like they’re giving it another shot. We are proud to announce the newest members of the Big Bear family! Henry Cavill (Man of Steel) and Gina Carano (Fast and Furious 6) are the proud owners of a Big Bear Akita. It was so great working with Henry and getting to meet him as well as Gina was truly a treat. Both Henry and Gina are genuine and a joy to be around. It was truly an honor to add them to our extended family and [we] thank them for their patience in meeting us and our children. It’s not every day that an A-list celebrity, much less 2 celebrities come to Beebe, AR to visit. Rumor has it the couple plans to name the new pooch Kal-El (Superman’s given name), but we have a few more suggestions just in case they want to go with something a little less on the wet nose. With filming of the Man of Steel sequel, Batman vs. Superman, scheduled to begin in February, is this a good time to bring home a new puppy? Tell us your thoughts in the comments below.